There are some photos you plan to take, and there are some photos that come out as happy accidents. 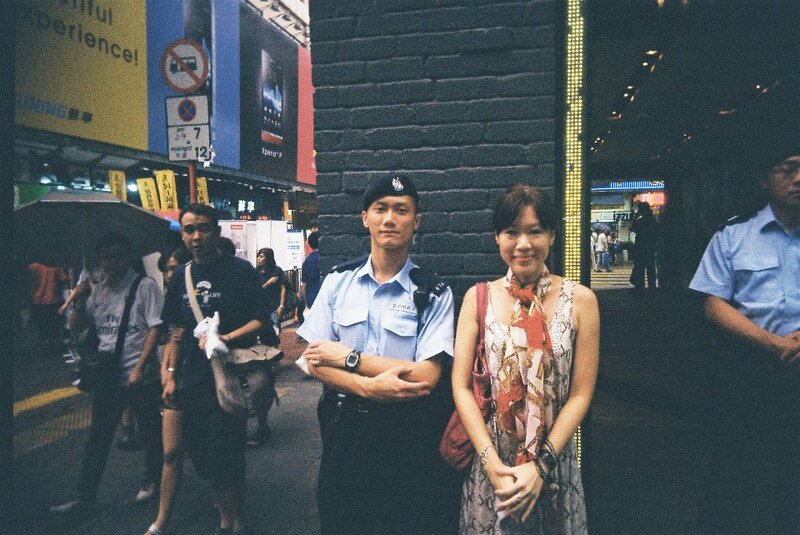 I was last in Hong Kong more than 5 years ago, then, there were friendly-looking policemen on almost every street corner, willing and able to give directions to tourists and lost pedestrians. Besides planning to fill up my camera with snapshots of those old flats that looked as if they have interesting stories to tell if they could speak, I wanted to take a photo with a Hong Kong policeman, a much-beloved sight in the city's metropolitan areas. Now the streets are reputed to be clean, liberated from the mafioso, and I was hard-pressed to find any policemen around, those that were seemed to be staggeringly busy and rushing from place to place. I badly wanted a photo with a Hong Kong policeman, so, finally on a drizzly day at Nathan Street I finally spotted two young chaps and hand-gestured my way to this photo, not being able to speak a word of their language nor they, mine.